This is a spectacular fall but I found that diamond falls both the upper and lower views just as spectacular. Diamond falls is a bit of a hike in. I didn’t measure it but it felt like 2 miles. There were several nice view points on the walk in showing the surrounding hills. 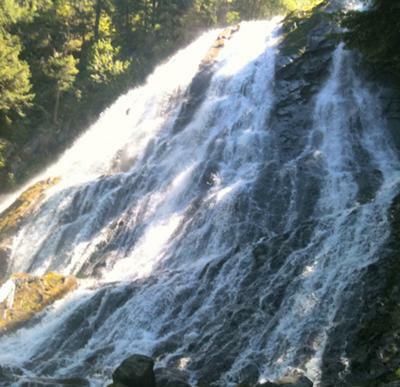 The book I used as a reference, A Waterfall Lover’s Guide to the Pacific Northwest by Gregory A. Plumb, listed the hike as moderate in difficulty but I would rate the side trail to the lower view of diamond falls as harder than that. I did enjoy the unique stairs and later the bridge over the creek that were cut from large fallen trees. I recommend caution on the trail as it was both narrow and wet. I also recommend bringing water and insect repellent as the mosquitoes were very hungry and plentiful. The picnic area makes this a great day long trip or a great pit stop for seeing the sights.